CSS Tab Designer is a free software that displays samples of beautiful linked tabbed menus using HTML + CSS + images. No more software could be found by searching the net. Unfortunately, however, the public site has already been closed and software can not be downloaded. It worked on Windows 10. However, since the software is old, we can not expect that we will continue to operate. So I will leave only the execution result as a sample here. If you do so, CSS Tab Designer itself will not work, no problem. 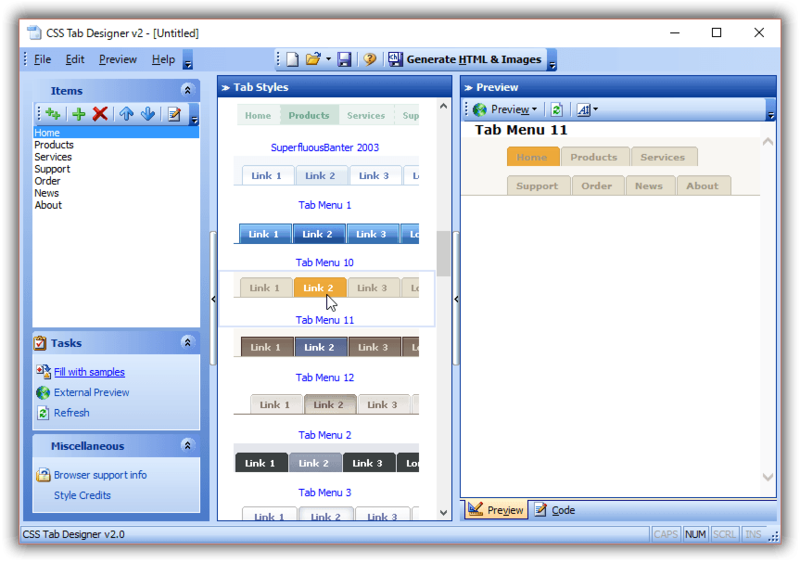 This file contains a set of CSS samples of the tab menu introduced on this page. There are also 66 samples in total, including the samples contained under the execution folder of the main unit. Below is a preview of the attached sample. At the same time, a link to display the Html file (Demo) for demonstration and CSS file (CSS) is also attached. Click on it if you like it, please make a tab menu with reference to that source. If you hold the mouse cursor over the tab menu, you react. Although it is a tab with a link, since the link destination does not exist, please be careful as 404 or the preview will be gone.